The sun is currently in Scorpio (from October 23rd - November 21st). If your sun sign is not Scorpio, these stones are still useful. The zodiac energy of each sign surrounds all of us based on the time of the year. The energies of Scorpio are at work now. Scorpio is one of the coolest signs of the zodiac and also one of the darkest. Scorpio is symbolized by a scorpion and there is a parable about a scorpion that embodies the energy of Scorpio perfectly. In the story a scorpion wants to get across a river. The scorpion asks a nearby frog if he can ride on it's back. The frog says no because she knows the scorpion will sting her. The scorpion says he wouldn't because then they would both drown so the frog agrees. When they get halfway across the river, the scorpion stings the frog. The frog asks why the scorpion did it and he says it’s just what scorpions do. Scorpios can't help but be who they are and the energy of Scorpio brings this out in all of us. The energy of Scorpio can help you to learn something new. It is also helpful in uncovering what has been hidden, once it’s out you can deal with it and move on. We're coming into the time of year where we start with a fresh slate and begin again. It's a good time to uncover things we haven't wanted to handle before and take this opportunity to move past them and before we can have a new beginning. If somethings needs to be dealt with and it needs a push this is the time. Scorpio is also all about power. Sometimes this power is too much for us and now is the time to release and let go some of this power so you can have some balance. Golden Yellow Topaz promotes awareness and bringing in new knowledge. Scorpios can benefit from this external awareness because they are very internally focused. Kunzite can be used to bring divine love into your heart. Scorpios are prone to unhealthy heart chakras due to the many secrets they keep. Use Labradorite to increase your strength, but allow it to transform your personal power in personal balance. Scorpios are often overpowered and need to let some of that go. Malachite releases toxins from the body, especially from the heart. Scorpios take things to heart and hold things in so Malachite can be used for physical and emotional healing. Mahogany Obsidian is a grounding stone, which all signs need at some point. Obsidian may be too harsh for Scorpios to use but Mahogany Obsidian is more subtle and also provides protection and eliminates blockages. Mookaite brings external awareness and intuition to the internally focused Scorpio. It is also incredibly healing. Peridot is wonderfully useful as a comforting stone. It provides comfort during the time after a problem has been resolved or during a new beginning. Use Turquoise to release anything that is no longer serving you as you look toward the future and move past things that hold you back. Unakite is a stone for spiritual insight. It is also highly emotionally and physically healing and beneficial for releasing things that have become trapped in your heart. Smokey Quartz can be used to protect you from yourself. During this time feelings of depression may increase because when Scorpio energy is high, you may hold things in that need to be let out. Chrysocolla is both calming and supporting. It takes the sting out of life which makes it perfect for this time of the year when the Scorpion rules the sky. Scorpios need to cleanse their heart chakra more than any other sign does and more than they need to cleanse any other chakra. This is because of their secretive nature. Rose Quartz is arguably the best stone for opening your heart. Scorpios hold the ultimate goal to make things better and happier. Rhodochrosite is a wonderful aid to feel more compassionate and deeply loving. Scorpio is feminine water sign, and what better stone to bring out these energies than aquamarine. Scorpios are good at hiding emotions and Aquamarine brings emotion to the surface. Apache Tears is a great stone for protection and grounding. It's more more subtle than Obsidian which could fuel the angst of a Scorpio. Charoite can be used for both physical and spiritual healing. The black and purple coloration brings both types of healing into one crystal. They swirl together and appears like storm brewing up healing and insight. Want my list of Scorpio crystals? Click the button below to request your list to be sent to your inbox. 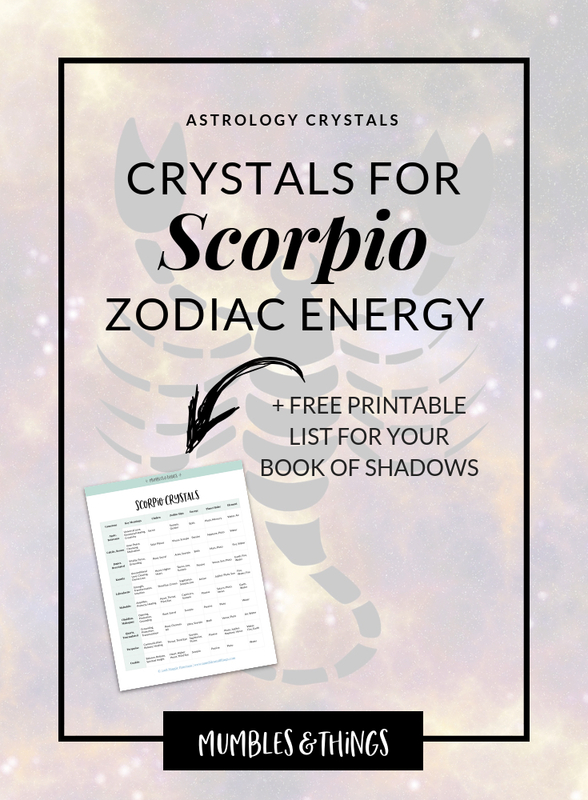 This list includes the top 10 crystals associated with the zodiac sign Scorpio, plus, the three key uses, primary chakras, polar energy, planetary ruler and element correspondence.